The liberal group MoveOn.org is launching an ad against Republican John McCain and his joke about bombing Iran, arguing that the nation "can't afford another reckless president." "That old, eh, that old Beach Boys song, 'Bomb Iran,'" he said. "Bomb, bomb, bomb, bomb, anyway, ah ..."
His audience laughed, but MoveOn.org called the comment dangerous. "America has lived through six years of a reckless foreign policy," an announcer says in the ad. "We're stuck in Iraq. More than 3,000 Americans are dead. And thousands more wounded. "Now comes John McCain with his answer to what we should do about Iran. John McCain? We can't afford another reckless president." The McCain campaign had no immediate comment to the ad on Friday. 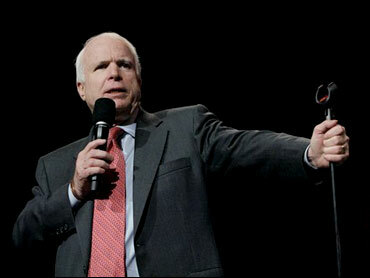 The head of MoveOn said McCain displayed "more out-of-control bravado." "At a tense moment, when cooler heads in his own party and many retired military leaders are calling on the president to negotiate with Iran, Senator McCain's outburst isn't merely inappropriate; it's dangerous," Eli Pariser, executive director of MoveOn.org Political Action, said Friday. McCain's comments, posted on YouTube.com, had been viewed at least 118,056 times as of Friday morning.